Vehicles in Kansas must be registered with the Department of Revenue. This applies to both owners of new vehicles and new residents to Kansas. When you apply for a new plate, you can choose from a range of specialty license plates and personalized styles. If you’re a new resident of Kansas or you have just purchase a new vehicle, you must register your vehicle at the Department of Revenue (DOR). Those with a disability may be qualified to apply for disability license plates. These license plates allow those to park in handicapped zones through the state. Additionally, there are also temporary plates which allows you to drive your vehicle legally while your plates are being processed or between purchasing a vehicle and driving it to the registration office. You must register your vehicle within 90 days of moving to the state; and, within 60 days of purchasing a new vehicle. Note: Temporary plates are valid for 60 days and they cannot be renewed. You should research by looking up available plate numbers before going to the DOR office and applying for the plates you want. The cost for personalized plates in Kansas is $45.50 which is valid for 5 years. You are still required to pay for additional registration fees and your usual renewal fees. Once you have successfully obtained the license plates for your vehicle, you must place the registration decal on the corner. It must be clearly visible and should it fall off or get lost, you must replace it right away. 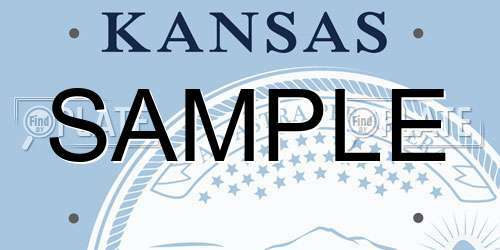 Kansas makes the process of renewing license plates quick and easy. You can visit the office in person, or renew your license plates online or by mail. You’ll promptly receive a new decal sticker which you can place over the old one. Don’t forget to renew your registration in advance of your expiration to avoid any unwanted late fees. In the event that your decals or license plates are stolen, you must file a police report right away. When you are applying for a replacement, you will require to show the police report to the DOR. *Note: fees vary by county within the state of Kansas. If your plates are damaged, you can bring then in and get them replaced for new ones. You must also fill out the same form for replacing your Kansas license plate. You may have to surrender your plates if you upgrade to personalized or specialty plates. As well, if you sell or give away your car and no longer need your license plates, you should surrender them to the DOR. You can send them in by mail or deliver them in person. An alternative to surrendering your plates in Arkansas includes recycling them so that they cannot be used again. In addition to the transfer fee, you may be obliged to pay for taxes and other services fees. Contact your nearest DOS in Kansas for more information. FindByPlate allows you to search license plates in Kansas and other states providing you with the information you need to make confident decisions.